Incense are carcinogenic! | That's Bad For You! Since I was a child, I have been around incense smoke. Incense have always seemed harmless to me, probably because some incense smell almost Godly. I remember dancing around in the smoke as a child, not thinking anything of it. My grandmother burned them on a regular basis. She even smelled of incense when you got close to her. My mother and all of my aunt’s have always burned incense as well. In fact, my mom is burning incense right now and when I told her they can cause cancer, she has claimed that this will be the last one (we will see). 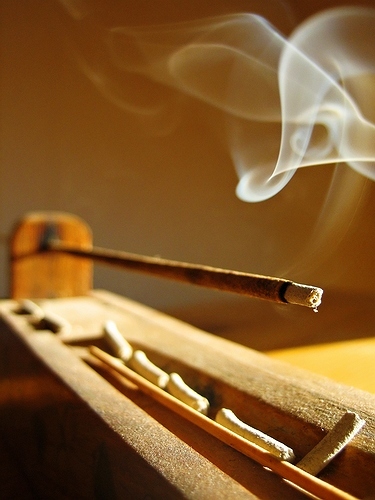 A study published in the September 2001 issue of the Bulletin of Environmental Contamination and Toxicology indicates that burning incense can expose people to dangerous levels of cancer-causing chemicals. If you burn incense, you may want to look into other ways of releasing pleasant smells into your home because they’re bad for you. As I recently discussed, air fresheners are toxic and there is evidence that says candles aren’t good for air quality either, but there are some “safer scents” that can make your house smell just as good. This entry was posted in BAD and tagged air fresheners, air pollution, fragrance, incense, lung cancer, scents, toxins by thatsbad4u. Bookmark the permalink.